YOU WILL BE AMAZED HOW MUCH EASIER IT IS TO FIND YOUR MAKEUP WHEN GETTING READY! 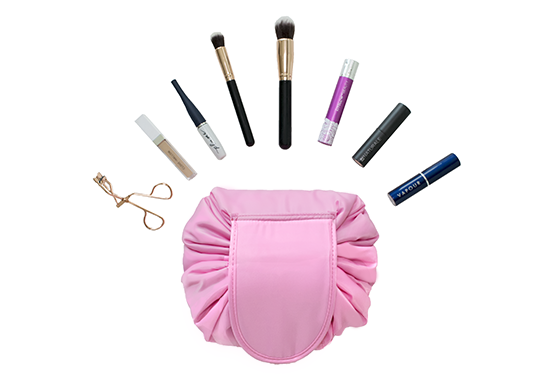 Our Bestie Bag makes your beauty routine super convenient. It’s large enough to carry your favorite products, and with it's padded interior and zipper compartments, it makes it easy to travel with too. Quickly access all of your products in seconds so you can get ready faster. Built in padding so your products stay protected while traveling. No need for multiple makeup bags, fit everything into one bag! Doubles as a cosmetics mat with a lip so your products don't roll off the counter and break. No more endless rummaging through bags to find your products. Easy to clean and will help you stay organized. Super fast way to take all your products with you anywhere you go. 2 interior pockets with zippers so you can store small items like jewellery or for keeping sponges clean. See all your products at once.